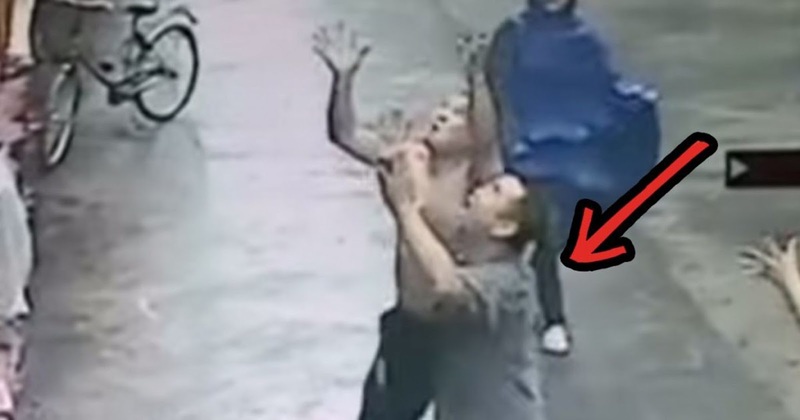 WOW!...This Man Made An Amazing Catch That Saved The Day! This iIs How He Did It! The scene you are about to watch here took place within Guangdong Province, in Zhongshan city, Xiaolan Town on Chaonan Road and was captured by a surveillance camera. It shows how a passerby saved the day by catching a baby who was falling down from two storeys of a certain building. As reported, this one year old baby was alone at home when this happened. He was trying to climb up the window when he slipped and fell out into the rainstorm. Lucky, Mr. Li and another man saw what was about to happen and stretched their arms and caught the baby. As revealed by the two, they did not have for thinking of what they were supposed to do. There only fear was to fail to catch the baby. You have to be really careful while watching this to be able to discover what is happening. This is because the whole process takes place really fast! SHARE with others by clicking below.